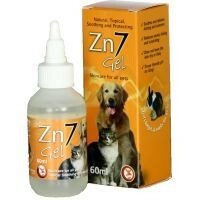 Zn7 Gel Zinc Skin Soothing Gel is a patented Neutralized Zinc in a Topical Formulation. A Topical skin care formulation in combination with amino acids L-lysine and Taurine. Zn 7 isindicated for use to aid in the management of superficial wounds or abrasions, sores, hotspots, rawness and other skin conditions effecting Pets. Each Pack contains a 60ml soft squeeze bottle with built in applicator tip. Zn7 should be applied directly from the bottle tip onto the affected area and rubbed in. Zn7 Gel should be applied twice daily after thoroughly cleansing and drying the affected area, the site may be dressed or left exposed to the air.